Currently having a Wagner obsession (the first opera by him I hear): A Das Rheingold conducted by Janowski. An Il Trovatore conducted by Giulini and Les Troyens with Vickers. Not in opera mode at the moment, but I do have some Cosi highlights on my iPod playlist. Die Tote Stadt by Korngold. Making my way through the Met Lepage Ring cycle on DVD. Making slow progress as i never seem to get enough time! Have Klaus Florian Vogts Lohengrin (the rat one) waiting to watch more of too. Feel in the mood for some Don Giovanni. Will probably watch the Amsterdam one with Ingo Metzmacher conducting. 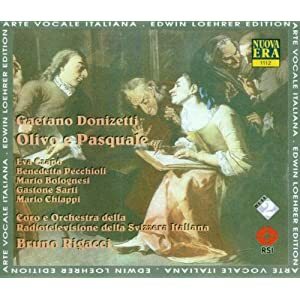 A strange production released a few years back as a nice Trilogy of Cosi, Le nozze and Don Giovanni. Always good fun to watch! Also on CD just got Cecilia Bartoli's new disc "mission". Not my usual type of music, too early period but might be soothing in the car. Hello Ralph & welcome to the forum. One of Donizetti's early ones & a lovely description by 'LindoroRossini' who uploaded this to YouTube. Last edited by tyroneslothrop; Nov-17-2012 at 05:11. Always been a favorite recording. The wonderful new Bergs Wozzeck from the Bolshoi with Teodor Currentzis conducting and production by Dmitri Tcherniakov. I had previously watched it on a long flight on my laptop but watching on a big tv is amazing. I have many cd versions of this opera and a few DVDs but i had forgotten how violent and disturbing an opera it is. Wonderful production and really good singing. The Wozzeck (Georg Nigl) is lighter in voice than some others but acts the part very well. That and some Rigoletto i think -in that kind of mood! All times are GMT +1. The current date and time is Apr-25-2019 17:18.